In Visual Basic 2015, we need to create a connection to a database before we can access its data. Before we begin, let’s create a new database. Since we are using SQL Server 2012 as the database engine, we will use Microsoft Studio Management Express to create a database with the mdf extension. We shall name this database file as test.mdf. After creating the database, build a table called Contacts and create two fields and name them ContactName and State respectively. Enter a few data in the table and click Save All to save the data. Now we are ready to connect to this new database.ADO.NET offers a number of connection objects such as OleDbConnection, SqlConnection and more. OleDbConnection is used to access OLEDB data such as Microsoft Access whilst SqlCOnnection is used to access data provided by Microsoft SQL Server. Since we will work with SQL database in our example, we will use the SqlConnection object. 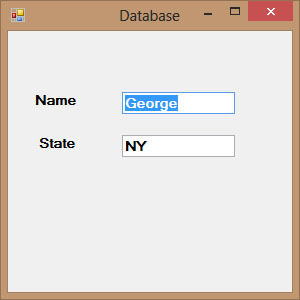 Establishing a connection to a database in Visual Basic 2015 using SqlConnection alone will not present anything tangible things to the user to manipulate the data until we add more relevant objects and write relevant codes to the project. Private Sub Form1_Load(sender As Object, e As EventArgs) Handles MyBase.Load MyCn.ConnectionString = "Data Source=TOSHIBA-PC\SQL2012; AttachDbFilename=C:\Program Files\Microsoft SQL Server\MSSQL11.SQL2012\MSSQL\DATA\Test.mdf; "& _ "User Instance=True;Integrated Security=SSPI"